The Kingsley family began to recognize that something wasn’t quite right when Brett was only 4-months-old. He wasn’t sitting up or rolling over like both his older siblings had at that age. Yet the pediatrician assured them Brett was simply a little delayed. By 6-months-old, Brett was sent to a local children’s hospital for an MRI and blood work, which brought devastating news: Brett had spinal muscular atrophy (SMA) type 1. The Kingsleys enjoyed King’s Island with Brett, thanks to A Kid Again — one of more than 200 nonprofit agencies UTC3 gifts can support. Following this heartbreaking diagnosis, Brett’s dad asked the pediatrician if SMA type 1 was terminal. The response stunned the father of three: one in every 6,000 babies are born with SMA, making it the leading genetic killer of children younger than age 2. Shortly after this rare diagnosis, Brett — an already fragile baby — contracted respiratory syncytial virus at 10 months, which landed him in the hospital for two months. While hospitalized, little Brett coded five times. Each time he pulled through — but not without repercussions. 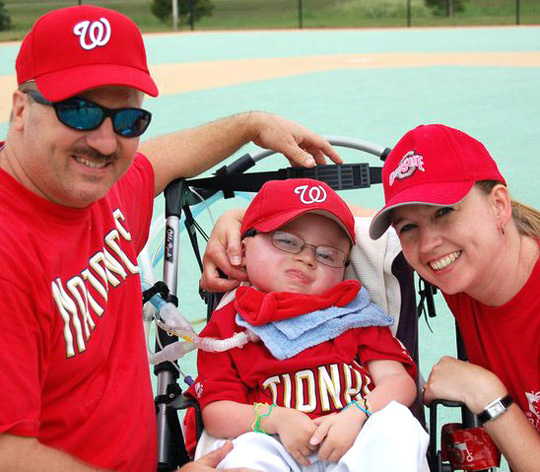 His parents faced yet another tough decision: insert a feeding tube or admit their little boy to hospice. The Kingsleys chose the tube for their little fighter. As he grew older, Brett’s mom, Allison, knew about his love of roller coasters. And so, thanks to A Kid Again — one of more than 200 nonprofit organizations supported by this year’s UT Community Charitable Campaign (UTC3, formerly the annual United Way campaign) — Allison and the rest of the family visited King’s Island this past summer. There, she eyed a small roller coaster and hesitated only for a moment. Swiftly, she scooped up Brett from his wheelchair, safely positioned his vent between them, and hopped onto the coaster for the ride of their lives. During the brief duration of their kiddy coaster adventure, Allison watched tearfully; Brett laughed wildly. All UT faculty, staff and retirees are invited to support any of hundreds of charities, such as A Kid Again, which help families just like the Kingsleys. UTC3 pledges will be accepted through Friday, Dec. 22. To pledge your gift, watch for the next email you receive from Dr. Michele Soliz, assistant vice president for student success and inclusion, and 2017 UTC3 chair. All gifts are tax-deductible, and each donor will receive a complimentary gift, be entered into a weekly drawing for prizes (such as an umbrella or leather portfolio), and will be invited to a breakfast buffet hosted by President Sharon L. Gaber in early January. For more information, including a complete list of charities you can choose to support, visit utoledo.edu/utc3. This entry was posted on Wednesday, November 29th, 2017 at 3:39 am and is filed under UToday .